As Gallup showed last month, congressional Democrats are significantly more esteemed than Bush-- and significantly more esteemed than their Republican colleagues in Congress. According to the latest Gallup Poll, 67% of Americans disapprove of Bush, while 69% disapprove of Republicans in the House and Senate and only 55% disapprove of Democrats in the House and Senate. I've talked to some of our Blue America candidates and they told me that since '06, the Republicans did everything they could to block and obstruct the daily business of the Congress in hopes that America would have a bad opinion of the House and Senate and it would lead to them retaking or making big gains in '08 and 2010. The 25% approval rating for the Republicans in Congress establishes a new Gallup Poll low, surpassing the 26% measured about this time last year. 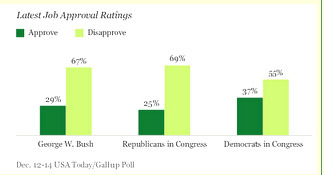 Gallup first began asking about approval of the Congressional parties in 1999. Well, Americans aren't buying their me first---America second attitude and in the end if they obstruct Obama's agenda from the outset then they will only fall deeper into the dark hole they have dug for themselves and America. I'm hoping they do just that so it knocks out some of the bipartisan rhetoric Obama is using, because they will not be willing players in the restoration of America and hand Obama a win. Never. Going. To. Happen. I think Obama will get his first stimulus package through with some grumblings from the Mitch McConnell wing and then it'll go downhill from there. As the Gallup poll points out for all to see: Nobody likes "Republicans."